I wish I had started my days earlier in Budapest so I could have consumed more pastries. I’d heard about the city’s multitude of fancy coffee houses, but still I was unprepared for the amazing pastries and lovely places I encountered. 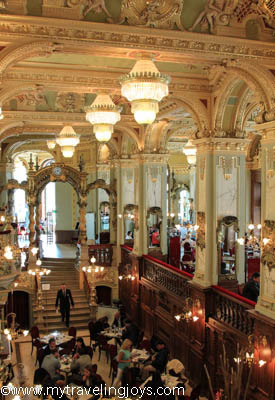 During the 19th century, at its peak, Budapest had more than 700 coffee houses. Now, that’s a lot of coffee! I could imagine plunking myself down in one of the café’s armchairs, nestled in a corner with a good book and a strong latté and spending a whole afternoon here. Nearby, a handsome Hungarian man was playing classical piano music. This place is the ultimate bookstore! 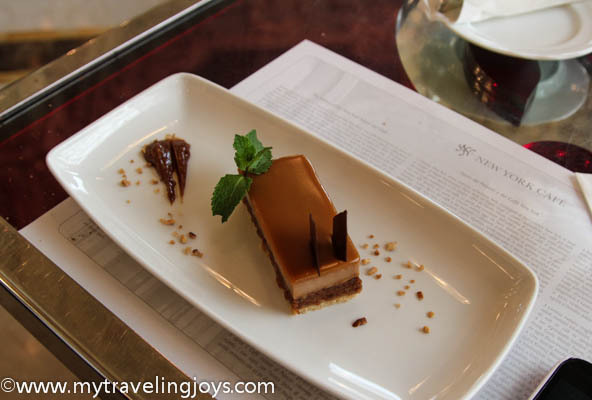 At Lotz, I ordered a latté and a slice of the infamous Hungarian Dobos torte, a five-layer sponge cake with chocolate buttercream and garnished with a hard caramel glaze. The cake was invented by Hungarian confectioner József C. Dobos, introduced at the National General Exhibition of Budapest in 1885 and presented to the Emperor of Austria Franz Joseph I and his wife. Now, this cake is definitely one for royalty! On my second day strolling around Budapest’s Fisherman’s Bastion and Buda Castle, I dragged hubby to the nearby historical, quaint coffee house of Ruszwurm. This is one of the city’s oldest pastry shops, opened in 1827 by Hungarian confectioner Ferenc Schwabl. The interior of this cozy and always crowded shop, named after its owner Vilmos Ruszwurm, from 1884 to 1922, even has some of the original 1840s Empire-style furniture. Ruszwurm isn’t a place to linger long as plenty of other tourists are waiting to grab a seat and sample another decadent bite of Dobos torte. However, I think it’s worth waiting for a table to taste a delicious bite of history. 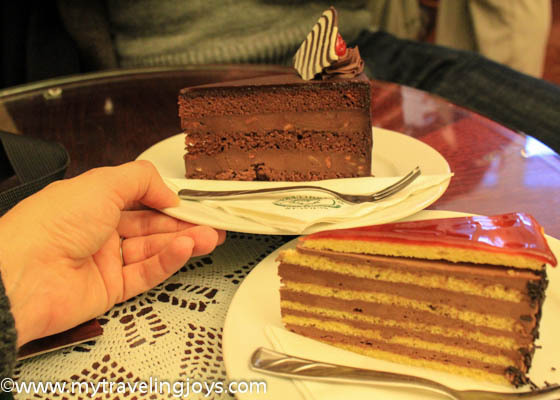 A decadent chocolate cake for hubby and another slice of Dobos torte for me at Ruszwurm in Budapest. 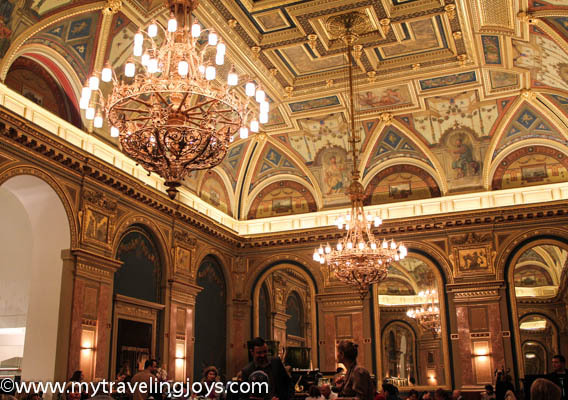 My most expensive coffee house visit was at The New York Café (New York Kávéház) located on a picturesque boulevard inside the luxurious Boscolo Budapest Hotel (formerly the New York Palace). One of my Istanbul friends, Elaine, had urged me to go to this café, telling me that I would love it. She was right! 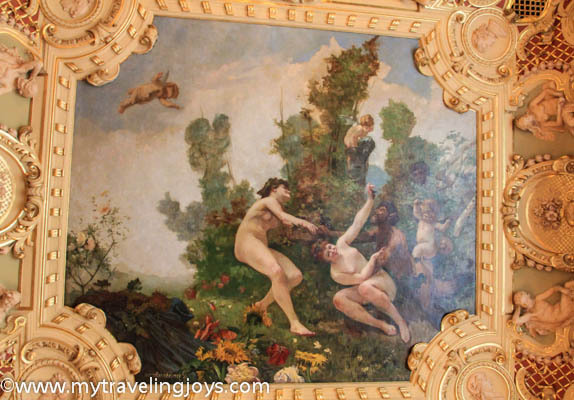 As soon as I walked inside, I took a step back in time and was greeted by gorgeous frescoes on the ceiling, gilded columns and stunning crystal chandeliers. 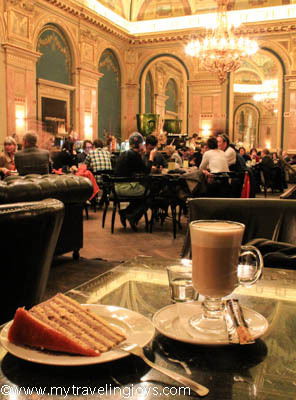 This café, originally built by the New York Life Insurance Company as its local head office in 1894, once served as the local hangout for Hungarian writers, newspaper editors, poets and artists. 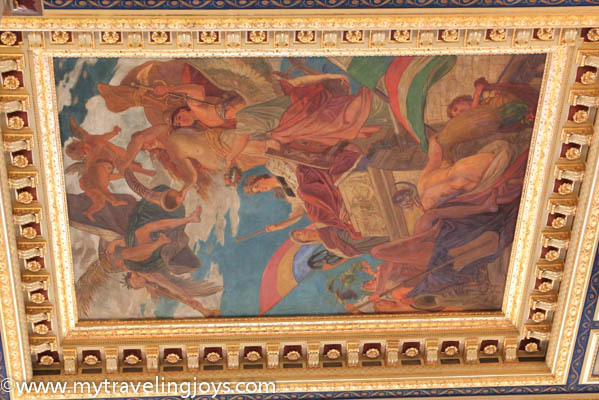 Luckily, the building survived World War II, Communist rule, a sporting goods shop conversion, neglect and finally was restored to its original splendor in 2006 and converted into the Boscolo Budapest Hotel. Interior of The New York Café in Budapest. Since I was solo, I treated myself to a fancy lunch of mixed greens with grilled rabbit, a glass of Hungarian white wine and of course, dessert, a sublime piece of “crunchy nut cake.” This sweet confection contained layers of a hazelnut dacquiose cake, a praline mousse and caramel glaze – at least that’s what I determined. This is the type of dessert I would have made at any of the restaurants I previously worked at in the U.S.
Service is a bit harried here, but I took it all in stride and enjoyed my 90 minutes of people watching and leisurely lunch. 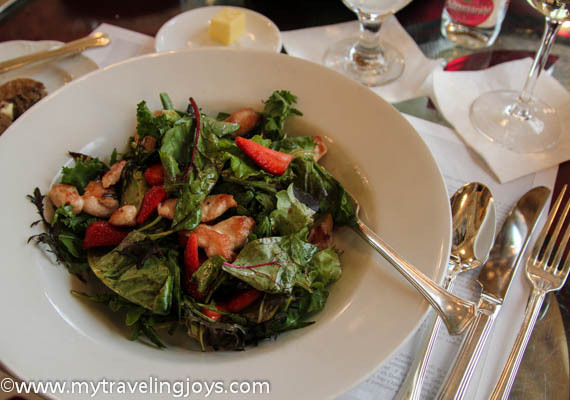 The atmosphere and delectable dessert was well worth the 10,000 HUF ($45) price tag! My only complaint is the nearby table of five older women that only ordered pasta and coffee drinks. If you’re going to visit the New York Café , you damned well better order dessert. You’d be crazy not to! 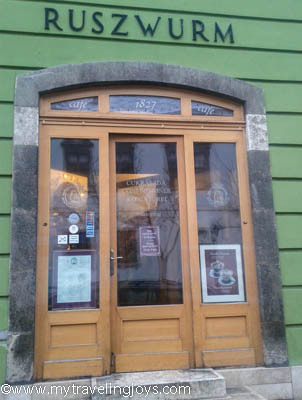 Budapest has dozens of coffee houses throughout the city, but these were three I visited and would return to in a second. 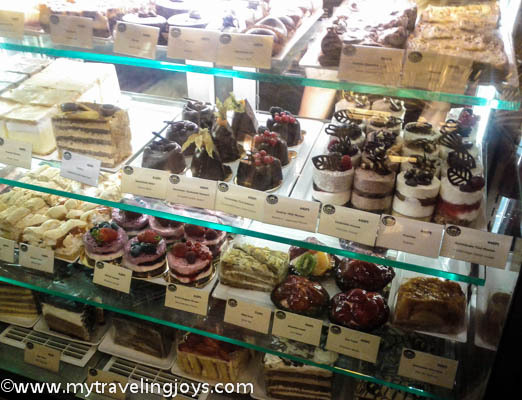 The amazing pastry display case at the Lotz Terem Café in Budapest. Oh!! And to think I am planning a visit. Thank you so much for sharing this. So beautiful. So now I must return to Budapest a third time to visit Lotz Terem -so many pastries, so little time. You right - Budapest is amazing city for foodies. Small restaurants in old Jewish Quarter, cafeterias with food from communist years, Gundel Restaurant, god... Flavor seem to be flyin' thru the city streets. And New York Cafe in Hotel Boscolo - we did photos of the same place against 'No Photo' signs. Kudos! @Pamela, You're welcome! Budapest is a beautiful city! Enjoy your trip! @R. Samolot, what fantastic photo of the New York Cafe! Thanks for sharing! You must have popped in quite early to get a photo of it completely empty! ;-) Budapest still has so many places left unexplored for us. Joy, we went for lunch there, and I really like empty restaurants, just before evening rush. You definitely have to go for September wine festival held on Buda Castle Hill. Nothing like that anywhere in the world. Wonderful wine not known to people from US, great atmosfere, beautiful sigts, and lots of happiness in the air. After that go to Gundel restaurant for Sunday branch - long lasting memory, and great Hungarian food (no tasty Warsovian burgers). Interior is decorated with original XIX century paintings and buffet is amazing. Remember to make reservation at least 3 weeks in advance. Then go shopping for food and pastry to Great Market Hall - old place selling everything from live Catfish to pickled Cauliflower. It is by Szabadsag hid Bridge one block from Donaube River. R. Samolot, thanks for all the foodie tips! We enjoyed some good Hungarian wine at several restaurants while in Budapest. We'll try and bookmark the wine festival too! Joy. Thank you. I & Mariusz are going to Budapest this weekend. We will use your recomendations. @Ania with VIP Service, Great! I hope you enjoyed seeing Budapest! Thank you very much for sharing this article. As a coffee lover I will visit these places definitely. Actually there are thousand of coffee club, you have to find out the best one.